Rough-edged men stand with cups of coffee along a concrete block wall. Well-dressed men in business suits stroll up and down the aisles. At 10:00 AM sharp, the sound of a gavel cracks the air as a man announces the start of the auction for the contents of the former North College Meridian-Kessler neighborhood landmark, Atlas Supermarket. 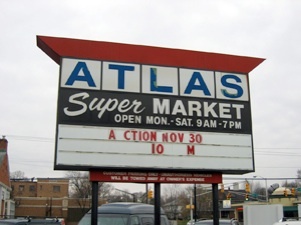 Atlas Supermarket sign announcing auction on November 30, 2004 at 10:00 AM. Click for a closer view. 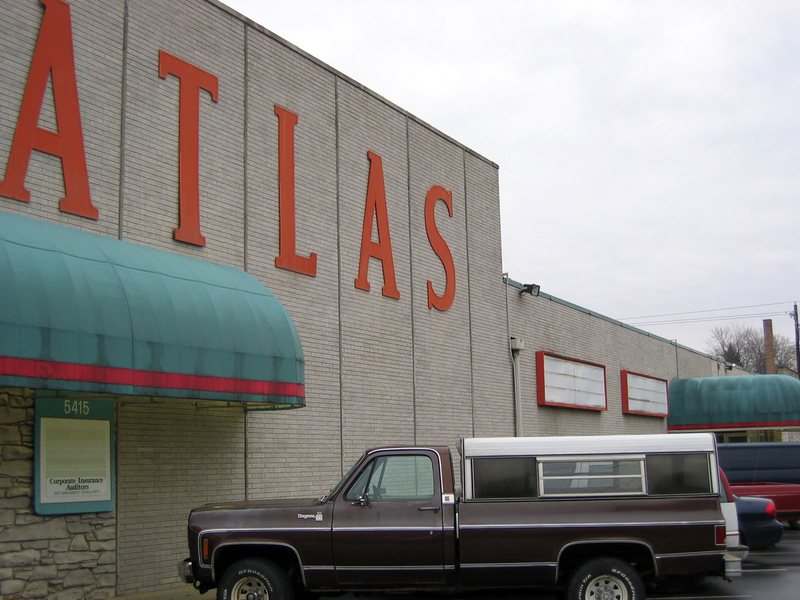 The Atlas Supermarket closed permanently on May 11, 2002 after 55 years of service to the community. Founded by Sidney Maurer and his wife Eleanor, the facility closed in the wake of a labor dispute with a meat cutter’s union. However, because of the abrupt nature of the closing, it was suspected that another contributing reason was Eleanor’s lack of desire to continue the business after Sid died on September 5, 2000. 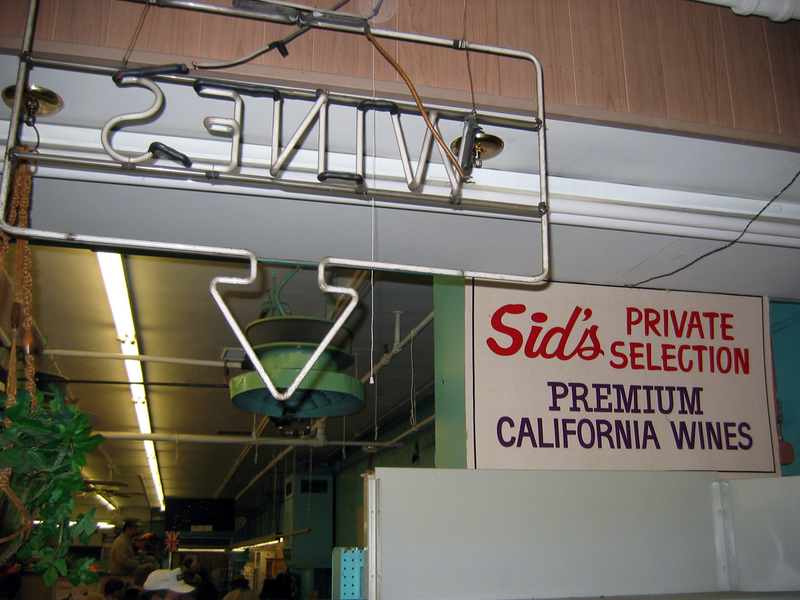 The store, and particularly Sid and Eleanor, were beloved by their customers and the community, mostly for the wide selection of hard-to-find items and the personal relationship the owners built with their customers. A true “gourmet” market in an era before ethnic and niche grocery stores like Trader Joe’s and Whole Foods, Atlas was the source for morel mushrooms, specialty meats and a wide selection of Kosher products. A vintage ad for Atlas from the North Side Topics on February 21, 1963. Click for a larger picture. To describe it simply as a store doesn’t quite summarize what it was, though. It existed really as an extension of Sid himself. The man knew every inch of the building, from the location of a particular canned product to the dark corners of the basement storerooms. In one of the most competitive businesses in America, he defied logic by never expanding beyond his single location, managing to keep the business running financially through good times and bad. He took risks on stocking items that could be found no where else in the city, or without his help in the store, for that matter. Sid would often find and order items simply at a customer’s request, and if money was a bit short between paychecks, he would often let payment wait until you could make it. 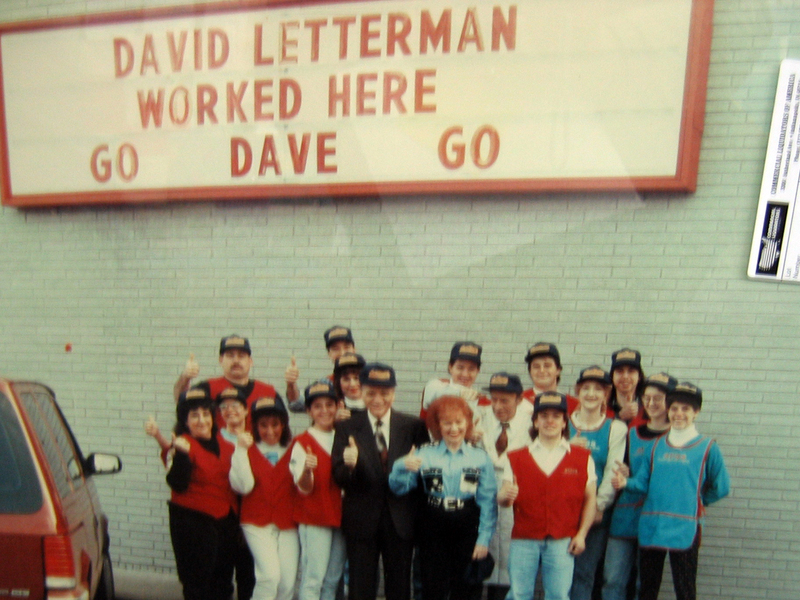 Atlas was perhaps best known outside of Indianapolis as the place where television star David Letterman worked for Sid as a stock boy in the 1960’s while attending Broad Ripple High School. The funeral for Sid was attended by hundreds, but shortly thereafter the future of the institution was in doubt. A series of public squabbles between Eleanor and her son Gary and the meat cutter union signaled the issues behind the scenes, followed quickly by the abrupt announcement of the closure in the spring of 2002. 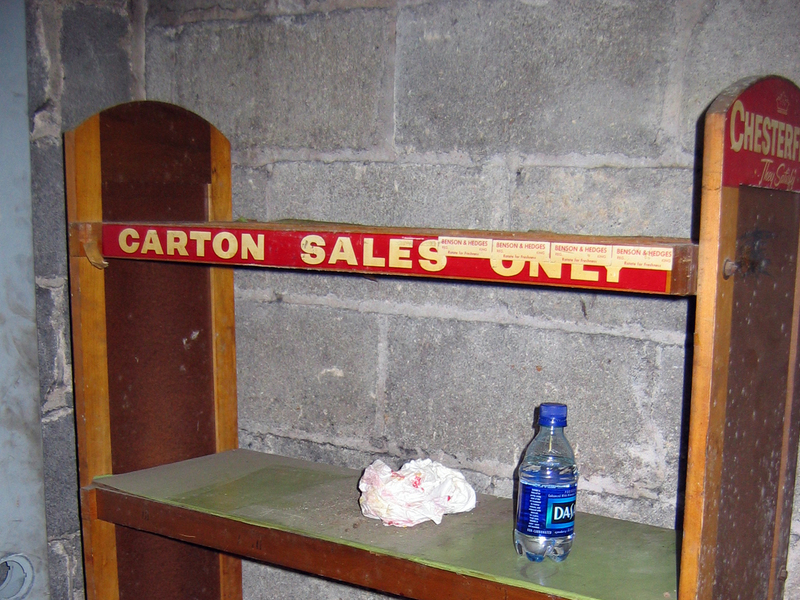 After the store closed on May 11, 2002, it sat idle, empty of product but not of its fixtures and history. Marsh Supermarkets bought the site in September, 2004 and promptly organized an auction of its contents, intending on renovating the building into a new concept called “Arthur’s Fresh Market” after Arthur Marsh, a company leader and resident of the area. City officials and local residents roundly applauded the deal, which included a five year tax abatement offered by to the company. Redevelopment suffered its first setback when North Carolina-based The Fresh Market filed a trademark infringement lawsuit against Marsh in February, 2005. In mid-October, 2005 a federal judge ruled in favor of Marsh, but then the company promptly announced that the project was on hold indefinitely, angering and disappointing residents. 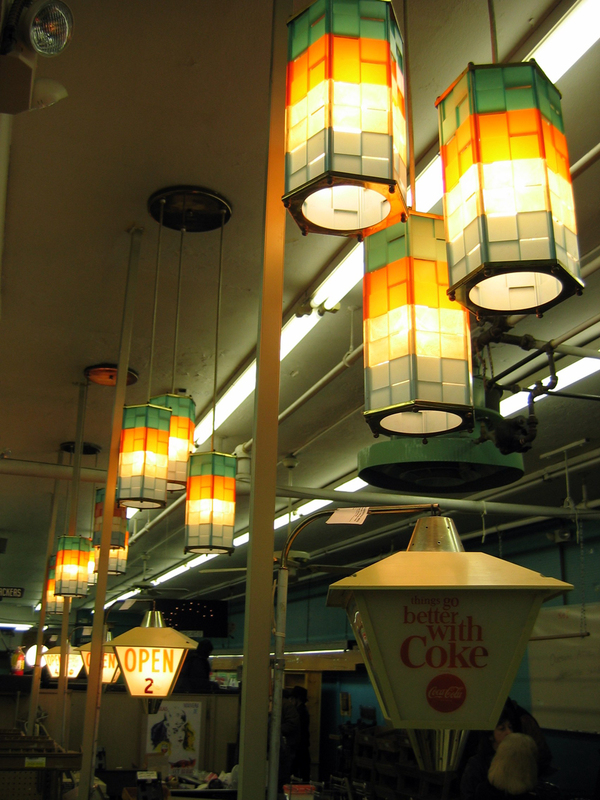 All the operational vintage checkout lights were on. 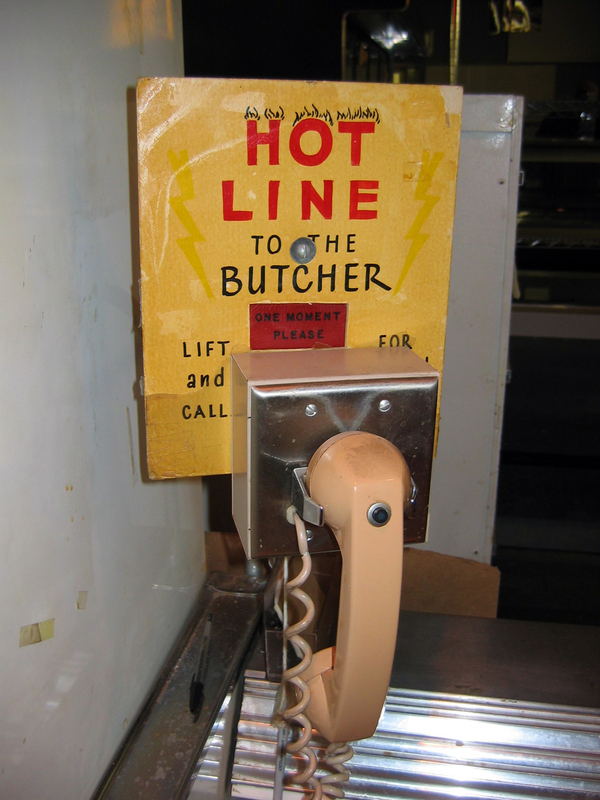 The “hot line” to the controversial butchers remained off. It was soon clear why: Marsh as a company was in deep trouble financially, and they had begun secretly looking for an investor or buyer. This was publicly announced on November 29, 2005, followed by the ouster on February 8, 2006 of much of the family leadership of the company, including Arthur Marsh himself. In April 2006, the company agreed to be acquired by Sun Capital Partners with the expectation of keeping many of the stores and structure intact, but with a new capitalization and focus on operational efficiency. The deal was complicated, however, on April 27, 2006 when Marsh received a competing offer from the Cardinal Paragon at a higher price, and the issue remains unresolved. Meanwhile, the now empty Atlas building sat vacant, while nearby residents waited and hoped for a positive conclusion. The exterior of the building on the rainy auction morning. Eleanor Mauer (left) confers with an auction attendee while watching the event. Participants crowd around the auctioneer as he begins calling the first lot. 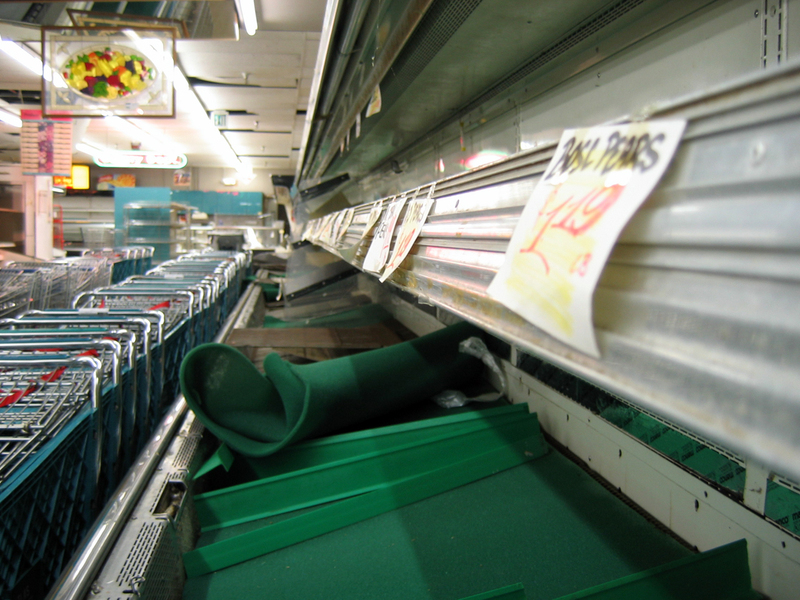 Everything was for sale, including empty produce cases and old shopping carts. In a final, ironic twist, the same Fresh Market company that sued Marsh over trademark infringement labored throughout June of 2006 to work out a deal to purchase an open one of their stores at the site. On June 27, 2006, the Meridian-Kessler Neighborhood association learned of the negotiations, which promise to finally bring high-end specialty grocery shopping back to the location after an absence of more that 4 years. It remains unclear as to what will happen to the building itself, but the original Atlas with its narrow aisles and dated decor is but a Lost Indiana memory. 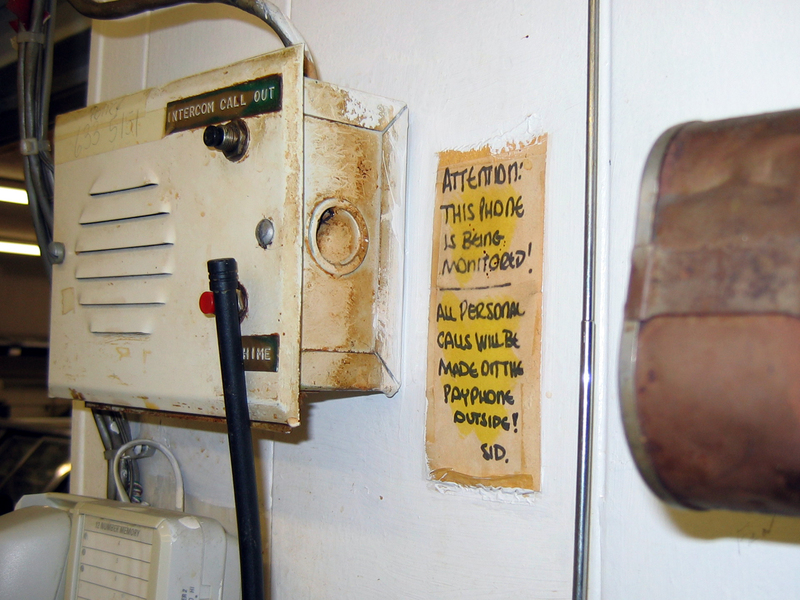 to a stern, hand-written warning posted next to a phone. to vintage photographs. And yes, the sign is correct. 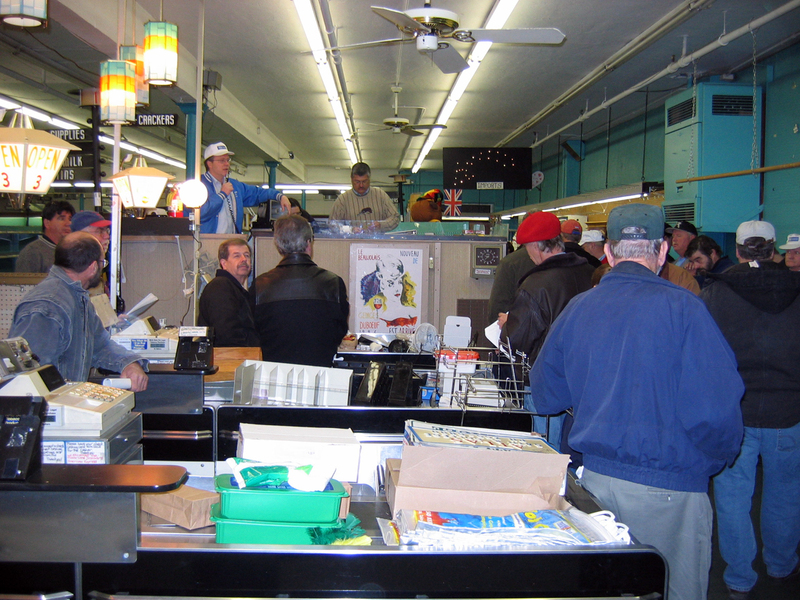 A clip of the auction inside Atlas on November 30, 2004. On March 1, 2008, The Fresh Market opened a new store on the same corner. Eleanor Mauer cut the ribbon. I’m doing a blog post which mentions the passing of Atlas Supermarket, and I wondered if I could use the photograph that appears near the top of this page. Thank you. carried his obituary in his billfold the rest of his life. Great information! Can you tell us more about Mr. Adler?